Cyclist killed in hit-and-run near Schmoberg, Ont. A snowstorm that slammed Toronto and much of the GTA earlier this week appears to have caused an indoor golf dome in Scarborough to collapse. “We will advise more info when it is available,” the website posting said. According to Environment Canada, about 20 centimetres of snow fell in downtown Toronto by early Tuesday morning, and 33 centimetres of snow fell at Pearson International Airport. Video footage of the golf dome shows the typically inflated structure completely flattened on the ground with piles of snow covering the material. A section of the indoor golf course is also covered in snow and chairs can be seen lying on their side. The dome material appears to have ripped in some areas. 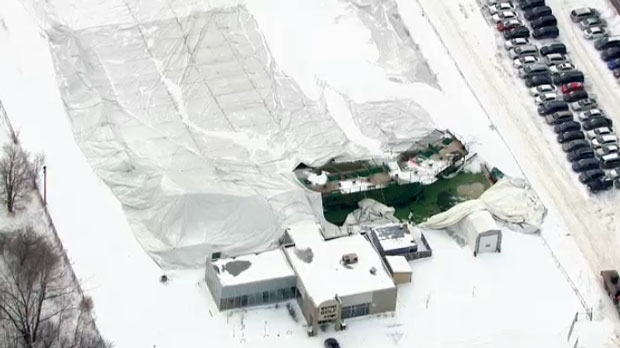 The owner of the Metro Golf Dome told CTV News Toronto that security video shows heavy winds and snow at around 5 p.m. and he believes that lead to the extensive damage. The Metro Golf Dome is usually open year round. In aerial footage of the Metro Golf Dome, the typically inflated structure appears to be completely flattened. 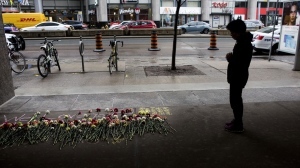 As family members, friends and strangers braved the rain Tuesday to honour the victims of the Yonge Street van attack, one man stood by the memorial marking the one-year anniversary of the horrific event making sure the flowers laid there looked pretty. Progressive Conservatives win minority government in P.E.I.